We dedicate certain rooms to the different charities, and then any sales during the day time from that game become donations for them. In the evenings we tend to give these games to the charities themselves to do with as they will. Some sell them on to members and patrons, others get sponsorship for their service users to play and some even raffle their games off. It is completely free for them to do as they will. Chester is a really new centre for Breakout so this time around we’re just donating to our charities, but come October and our next charity we already have things in motion to let the charities take full advantage. Parkinson’s UK, Joining Jack, Cheshire Search and Rescue and Nightingale House Hospice. Cheshire Search and Rescue were one of our most successful charities on our last charity day. Cheshire Search and Rescue are a completely voluntary based charity who work to help find those who are lost in Cheshire. Sometimes we don’t think of Cheshire as a dangerous area, but there is actually an exceptionally large amount of woodland, quarries and moors so there are, in fact, many hazardous areas. As well as countryside based operations, Cheshire Search and find vulnerable people who have either ran away, or left their safe space and don’t have the capacity to find their way home. We can often be scared enough when we find ourselves alone, but throw in a dangerous environment and this becomes unsafe very quickly. Manchester are still supporting Cheshire Search and Rescue this charity day, but with Chester now in the game, it was lovely to be able to give them more. 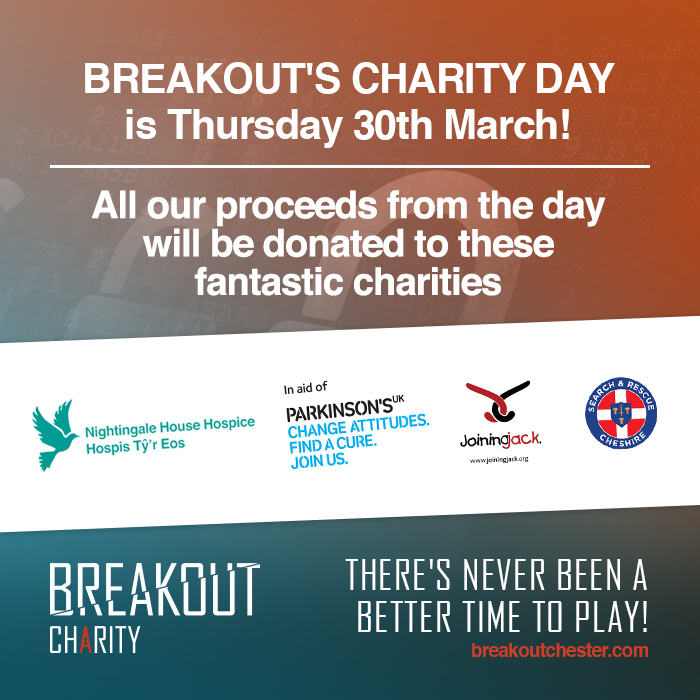 Nightingale House Hospice is a special charity that is very important to Breakout. It is based in the Wrexham area, as well as the day care unit you’d expect from a hospice, they work tirelessly to provide extensive Palliative Care Services – Free of Charge. These include bereavement support services, an outpatient clinic, inpatient ward, specialist lymphedema unit, occupational therapy, complementary therapy, physiotherapy inc hydrotherapy pool and ambulance service.